Los hijos de un victima de cncer de pulmn causado por la exposicin del amianto demandan a Chevron y Gulf Oil a favor de su padre. (PRWEB) March 31, 2009 -- A favor de su padre quien muri de mesotelioma -- cncer de pulmn causado por la exposicin del amianto -- cuatro hombres de Tejas demandan a las compaas Chevron y Gulf Oil. Kyle, Dan, Ted y Mark Bergeron reclaman que la enfermedad de su padre Gliese Bergeron, quien muri de mesotelioma en el 22 octubre de 2008, fue causada injustamente. Segn el pleito archiv 22 diciembre de 2008 en el Tribunal de distrito de Condado de Jefferson, Gliese Bergeron trabaj como un fontanero, camionero, planificador de aislante y mantenimiento con Chevron y Gulf Oil de 1942 a 1983. Los hijos de Bergeron discuten que la exposicin de su padre al amianto fue previsible y debe haber sido anticipado por los acusados. El pleito indica que Chevron y Gulf Oil fueron supuestamente negligentes como ellos fallaron de probar el aire para averiguar que los niveles de fibras de amianto en el sitio del trabajo y tambin advertir a sus empleados con respecto a los peligros para la salud asociados a la exposicin del amianto. Segn el traje, Chevron y Gulf Oil fallaron supuestamente aplicar medidas de seguridad apropiadas para proteger a trabajadores, para realizar vigilancia industrial apropiada de higiene, para entrenar adecuadamente, para educar e instruir a trabajadores en los riesgos de amianto y fallaron supuestamente proporcionar y sugerir que el uso de equipo protector personal proteger a trabajadores. La queja tambin indica que las compaas fallaron supuestamente aplicar y recomendar que controles de ingeniera para minimizar la exposicin de trabajadores al amianto, fallaron de excluir el manejo impropio de fibras de asbesto, fallaron de proporcionar a trabajadores con un rea segura para trabajar y desarrollar y aplicar un programa profesional de medicina para vigilar la exposicin de trabajadores. El juez Gary Sanderson de Tribunal de distrito 60 estar oyendo el caso. Este comunicado de prensa fue escrito por cncer de pulmn. Visite por favor la pagina para ms informacin. George Bramblett, a partner in Haynes and Boone's Business Litigation Practice Group, has been selected to receive the Dallas Lawyers Auxiliary's 27th annual Justinian Award honoring dedication to community service. 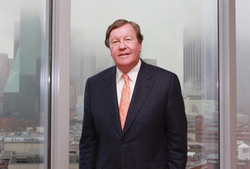 Dallas, TX (Vocus/PRWEB ) March 31, 2009 -- George Bramblett, a partner in Haynes and Boone's Business Litigation Practice Group, has been selected to receive the Dallas Lawyers Auxiliary's 27th annual Justinian Award honoring dedication to community service. I can say without qualification that he is a lawyer's lawyer. These are some of the reasons why he is so deserving of the Justinian Award. It is no surprise he follows Richard Haynes and Mike Boone as a recipient of this award. He has been a cornerstone of this firm and in his community throughout his career. Mr. Bramblett is the third Haynes and Boone partner to receive the Justinian Award, following in the footsteps of founding partners Richard Haynes, honored in 1989, and Mike Boone, selected in 2004. Haynes and Boone is believed to be the only firm to see three of its partners bestowed with this prestigious honor. "George is an excellent lawyer and leader because he has good judgment on the most complex issues," said Mr. Boone. "I can say without qualification that he is a lawyer's lawyer. These are some of the reasons why he is so deserving of the Justinian Award." The Justinian Award, established in 1982 by the Dallas Lawyers Auxiliary as a first award of its kind in the United States, recognizes an outstanding attorney each year who has shown dedication to volunteer service. Mr. Bramblett was selected for his unwavering support of various agencies and causes throughout his 35-year tenure as a Dallas-area lawyer. "Haynes and Boone was built on a culture of service and George sets the bar for the rest of us," said Haynes and Boone Managing Partner Terry Conner. "It is no surprise he follows Richard Haynes and Mike Boone as a recipient of this award. He has been a cornerstone of this firm and in his community throughout his career." Longtime friend, colleague and 2006 Justinian Award winner, Thompson & Knight partner Sam Burford said, "I cannot think of any attorney more worthy of the Justinian Award than George. Since our law school days at SMU, George has been an example of what trial lawyers, and for that matter, all lawyers, strive to become: smart and resourceful, tenacious in representing clients and successful by any measure, not only in bar activities, but also in community leadership roles. George simply represents the best in all aspects of the legal profession." A partner in Haynes and Boone for more than 30 years, Mr. Bramblett has maintained a diverse litigation practice and earned professional accolades along the way. He was named Trial Lawyer of the Year by the Dallas Bar Association in 2001, serves as a fellow in the American College of Trial Lawyers and is a fellow in the American Board of Trial Advocates, where he served as President of the Dallas Chapter. He is a frequent CLE speaker and has written widely on courtroom procedures, including "The Court's Charge" and "The Ultimate Trial Notebook," both penned for the State Bar of Texas. Mr. Bramblett's many honors include the SMU Law School Distinguished Alumni Award for Private Practice, Hall of Fame in the Baylor College of Dentistry, the Anti-Defamation League Jurisprudence Award, and the Alliance for Higher Education Award. In 2008, Mr. Bramblett received the Dallas Bar Foundation Fellows Award, the foundation's highest honor. Mr. Bramblett has been included in Texas Super Lawyers, published by Texas Monthly Magazine, every year since its inception. Texas Super Lawyers also has designated him a Top 10 Lawyer in Texas. Mr. Bramblett is a member of the Haynes and Boone Board of Directors. In his practice, he represents clients in the full range of business, commercial and tort litigation in state and federal courts throughout the nation and before administrative agencies and arbitration tribunals. Haynes and Boone, LLP (http://http://www.prweb.com/releases/Haynes_and_Boone/George_Bramblett/http://www.prweb.com/releases/Haynes_and_Boone/George_Bramblett/http://www.prweb.com/releases/Haynes_and_Boone/George_Bramblett/http://www.prweb.com/releases/Haynes_and_Boone/George_Bramblett/http://www.prweb.com/releases/Haynes_and_Boone/George_Bramblett/http://www.prweb.com/releases/Haynes_and_Boone/George_Bramblett/haynesboone.com) is an international corporate law firm with offices in Texas, New York, California, Washington, D.C., Mexico City and Moscow, providing a full spectrum of legal services. With almost 550 attorneys, Haynes and Boone is ranked among the largest law firms in the nation by The National Law Journal. The firm has been recognized as one of the "Best Corporate Law Firms in America" (Corporate Board Member Magazine, 2001-2008), as one of "The Best 20 Law Firms to Work For" (Vault.com, 2008), and as a Top 100 law firm for both diversity (MultiCultural Law Magazine, 2009) and women (Women 3.0, 2008). Encore Payment Systems Announces Partnership with ControlScan, Inc.
State of the ECM Industry – who’s achieved it, how are they doing it and is it working for them? Silver Spring, MD (Vocus/PRWEB ) March 31, 2009 -- In its annual State of the ECM Industry research report, AIIM has found that managing electronic office documents is still a challenge for 47% of organizations, and that modern business communication channels—instant messages, text messages, blogs and wikis—are uncontrolled and off the corporate radar for 75% of businesses. However, AIIM’s research also found that whereas two years ago compliance was the main driver for bringing this content into a controlled and searchable environment, cost savings and efficiency are now the main motivating factors. According to the AIIM survey, for those that have invested in ECM or document and records management solutions, hard dollar savings have on the whole turned out on plan, and soft dollar benefits have exceeded expectations. Compared to other significant technology investments, ECM implementations have generally produced better returns. The survey also found that spending on Business Process Management (BPM) and Workflow was likely to grow strongly in 2009, with Enterprise Search, Email Management, Document Management and Records Management all set to show positive growth. 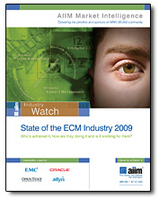 The full report in the AIIM Industry Watch series, "State of the ECM Industry – who’s achieved it, how are they doing it and is it working for them?” can be downloaded free at www.aiim.org/stateofecm2009 and is supported by EMC, Oracle, Open Text, and Allyis. For over 60 years, AIIM has been the leading non-profit organization focused on helping users to understand the challenges associated with managing documents, content, records, and business processes. Today, AIIM is international in scope, independent, implementation-focused, and, as the representative of the entire enterprise content management (ECM) industry - including users, suppliers, and the channel - acts as the industry's intermediary. Have You Ever Dreamed Of Creating Your Own Personal Fragrance? Reins International California operates restaurants in southern California under the name of Gyu-Kaku in Beverly Hills, Huntington Beach, Pasadena, Sherman Oaks, Topanga Canyon, and Rancho Cucamonga. Gyu-Kaku maintains a tip pooling policy under which servers receive a high percentage of tips left by restaurant customers, with lesser percentages of tips shared with bussers, bartenders, kitchen staff and dishwashers. In a class action filed in Los Angeles Superior Court certain servers employed at the restaurant claimed that the practice of tip pooling violated Section 351 of the California Labor Code. The Superior Court dismissed the lawsuit and on Friday, March 27, 2009, the Court of Appeals for the Second Appellate District affirmed that ruling in Etheridge V. Reins International California, Inc., Court Of Appeal Of The State Of California, Second Appellate District, Division Three, Case No. B205005. (PRWEB) March 31, 2009 -- In a class action filed in Los Angeles Superior Court certain servers employed at Gyu-Kaku Restaurant claimed that the practice of tip pooling violated Section 351 of the California Labor Code. The Superior Court dismissed the lawsuit and on Friday, March 27, 2009, the Court Of Appeals For The Second Appellate District Affirmed That Ruling In Etheridge V. Reins International California, Inc., Court Of Appeal Of The State Of California, Second Appellate District, Division Three, Case No. B205005. The Court of Appeals ruled that tip pooling does not violate Section 351 of the California Labor Code. That section of the Labor Code provides that gratuities or tips are the sole property of employees. Reins International California operates restaurants in southern California under the name of Gyu-Kaku in Beverly Hills, Huntington Beach, Pasadena, Sherman Oaks, Topanga Canyon, and Rancho Cucamonga. Gyu-Kaku maintains a tip pooling policy under which servers receive a high percentage of tips left by restaurant customers, with lesser percentages of tips shared with bussers, bartenders, kitchen staff and dishwashers. The Plaintiffs in the case claimed that in order for any tip pool to be valid under the Labor Code any person permitted to receive a tip had to provide direct table service to customers. In other words, a bartender who prepared a drink but did not bring it to the customer at a table should not receive any tip, while if a bartender prepared a drink and brought it to the table, then that person could participate in the tip pool. The Court of Appeals rejected the Plaintiffs' argument. The Court stated: "tip pooling is not illegal when the participants in the tip pool contribute to the patron's service, even if not providing direct table service." "While, in some restaurants, the duties of bussers include filling water glasses, bringing rolls and butter, clearing the table between courses and pouring coffee, it is certainly not always the case that patrons receive direct service from bussers. At some restaurants, servers handle the coffee; at many restaurants, water conservation is practiced and water is not delivered unless requested; at some meals, there are no rolls and butter; in some circumstances, all of the food is served at once, and the busser does not clear the table until after the patron departs. But a "direct table service" limitation would allow a busser to participate in a tip pool if the busser clears the plates while the patron is still seated at the table, but not to participate if the busser waits until after the patron has departed. The work is the same; the next patron still starts his dining experience with an equally clean table, but the busser who cleans between patrons would be barred from participating in the tip pool because he does not personally interact with any patrons. This illogical result casts doubt on any "direct table service" requirement." Rather, than adopt a direct table service requirement, as urged by the Plaintiffs, the Court of Appeals instead endorsed a "chain of service" approach. Under the chain of service rationale, as the Court noted "Dishwashers and other kitchen staff are encouraged to give their best possible service as they know they will participate in the financial rewards if the customers are pleased with their work, even though the customers do not personally see them doing it. And a mandatory tip pool makes certain that these employees receive their fair share when the patrons are pleased with their service, but have no way to tip them directly." The tip pooling system adopted at Gyu-Kaku restaurants permits all employees to share tips in a way that is directly proportional to their contribution to the totally dining experience of restaurant customers. It is that fair and equitable approach which the Court of Appeals endorsed in this case. For further information about this case, contact Russell Thomas at 949.752.0101 or visit http://www.employersattorneys.com. The Kazan Law Firm continues its sponsorship of ADAO's Asbestos Day Conference, renewing its commitment to bring information about medical advances and research, victims' rights legislation, and education on the risks of asbestos exposure to the world. The Conference this weekend will include more than a dozen speakers and the presentation of several awards. Oakland, CA (PRWEB) March 31, 2009 -- The Kazan Law Firm is proud to continue its sponsorship of ADAO's Asbestos Awareness Day Conference. As leaders not only in asbestos litigation but in the fight for the rights of asbestos victims around the globe, the Firm has also been a dedicated supporter of research and education regarding the diagnosis, treatment and prevention asbestos related-diseases. The 5th Annual Asbestos Day Awareness Conference will be held at the Manhattan Beach Marriot, California, from Friday March 27 to Sunday March 29. Included among the topics covered will be Prevention of Asbestos Exposure in Homes, Schools, Hospitals and Workplaces; Detection and treatment of asbestos-related diseases; Support for Asbestos Victims and their families; and ongoing global advocacy efforts. The impressive roster of conference speakers will include Laurie Kazan-Allen, Barry Castleman, Linda Reinstein and many others. US Senator Barbara Boxer will be presented with the Tribute of Hope Award for her commitment to the banning of asbestos. The conference is made possible with support and collaboration of Barbara Ann Karmanos Cancer Institute, International Ban Asbestos Secretariat (IBAS) and the many dedicated sponsors who have contributed to making the most advanced medical, occupational and environmental information available worldwide. Kazan Law has been fighting for the rights of asbestos victims since 1974, and has long stood in the forefront of asbestos litigation, having represented over a thousand people with cancer, focusing on those with mesothelioma, a disease whose only known cause is asbestos exposure. The firms' attorneys have been instrumental in winning precedent-setting rulings by the California Appellate and Supreme Courts. The Firm has also provided counsel to the ADAO as amicus in appellate cases, maintains an active pro bono practice on behalf of labor organizations and public interest groups, and works for the international ban of asbestos through support and involvement with such agencies as IBAS. West Simsbury, CT (PRWEB) March 31, 2009 -- WebAward.org - The Web Marketing Association, host of leading website awards competition WebAwards, released the Internet Standards Assessment Report (ISAR) to help the advocacy industry learn to create more effective and engaging websites. "As the standard of excellence for websites continues to increase, consumers (and WebAward judges) are increasingly picky about what they consider to be an effective website," said William Rice, president of the Web Marketing Association, Inc. "Advocacy sites are the public service announcements on the Internet. Often developed on a shoestring budget or pro bono, the best sites don't just inform about an issue - they tell a story and allow people to take action." Advocacy sites are used to create awareness to social issues. Added to the WebAwards in 2002, advocacy sites have outperformed the overall ISAR index five out of the seven years in which they competed. They showed strong content and copywriting scores once again in 2008. Due to the conservatism and tight budgets of advocacy organization, advocacy sites tend to score lowest in innovation and technology. The 2008 WebAward for Best Advocacy website went to Clarity Coverdale Fury for Are You Ok With That? Companies and organizations wishing to have their advocacy web site evaluated against the ISAR Index and be considered for a WebAward, which can help boost a Website's credibility and marketing efforts, can learn more at WebAward.org. The Web Marketing Association is now accepting entries into its 13th annual international WebAward Competition. The WebAwards is the standards-defining competition that sets industry benchmarks that the Internet Standards Assessment report is based upon. The advocacy industry represents an important category in the WebAward competition, and the Web Marketing Association will again be honoring the Best Advocacy Web site of 2009. The deadline for entry is May 29, 2009 and the WebAward Web site is located at WebAward.org. Lawrence M. (Larry) Schoenke, Shareholder and litigator in the Labor Employment and Personnel practice area of Miller Brown & Dannis, represented the St. Helena Unified School District in the California Court of Appeal, San Francisco, case (Hildebrandt v. St. Helena Unified School District_Cal.App.4th_2009 WL 708800) in which the Court decided that part-time school employees with greater seniority are not automatically entitled to displace full-time employees with lesser seniority. In this important and timely decision, the Court confirms a School Board's power to determine the amount of time a teacher or other certificated employee will serve students, thereby enabling the Board to better staff their educational programs and carry out the educational mission of the District. Personnel division of Miller Brown & Dannis (MBD), California's full-service education law firm since 1978, announced a significant victory for all California school districts in the appellate court ruling that recognizes the School Board's "special competence" to determine the educational needs of its students in staffing schools and educational programs. Miller Brown & Dannis successfully represented the St. Helena School District at the administrative layoff hearing, at the trial court level in Napa Valley and in the litigation before the California Court of Appeal in San Francisco. Lawrence M. (Larry) Schoenke, lead litigator for Miller Brown & Dannis representing the St. Helena Unified School District, states: "All California School and Community College Governing Boards will benefit from this decision because it provides much needed clarity regarding the flexibility they have in determining layoffs. If the Districts are going to successfully handle budget cuts, while at the same time retain any hope of improving our schools, the governing boards need to be able to make layoff decisions based on what's best for the students." This is a victory for all California School Districts, as well as the communities they serve, in that it offers relinquishment in certain circumstances (here where the issue is the layoff of part-time vs. full-time employees), from the strict adherence to the rule of seniority. Continues Schoenke: "This is a victory for all California School Districts, as well as the communities they serve, in that it offers relinquishment in certain circumstances (here where the issue is the layoff of part-time vs. full-time employees), from the strict adherence to the rule of seniority." Validating the arguments Miller Brown & Dannis has been making for years on behalf of school districts in various administrative hearings throughout California, the Court of Appeal in San Francisco agreed with MBD that the needs of the District's educational program come first, regardless of seniority issues relating to the lay off of part-time vs. full-time teachers. In this case, the retention of a full-time employee provided necessary consistency for the educational program in question and was, therefore, deemed a better decision than retaining a part-time employee on the basis of seniority alone. Miller Brown & Dannis was successful in representing the St. Helena School District all the way through this case, from the administrative level, to the trial court, and ultimately in the appellate court, bringing clarity to complex legal issues that effect every school district throughout the state. Founded in 1978, Miller Brown & Dannis is a full-service education law firm, exclusively serving California. Representing numerous school districts, community college districts and county offices of education, MBD is recognized throughout California as a firm that applies creative, proactive, in-depth advice and strategies to achieve cost-effective results on behalf of its clients. M+Platform is the foundation of interoperable, compliant, and secure email lifecycle management. At HIMMS09 Messaging Architects will showcase how physicians and healthcare providers can use its email lifecycle management solution to securely access complete patient medical records from anywhere. Montreal, Canada (Vocus/PRWEB ) March 31, 2009 -- Messaging Architects, the expert in email risk management and compliance, today announced it will exhibit at HIMSS09 Annual Conference and Exhibition in Chicago, April 4-8. Messaging Architects will showcase how physicians and healthcare providers can use its email lifecycle management solution to securely access complete patient medical records from anywhere. The messaging infrastructure of healthcare providers plays a critical role in managing patient services and collaborating with partners and suppliers. It also exposes these entities to security threats and compliance challenges that include leaks of confidential patient records, malware intrusions, HIPAA mandates, e-discovery and litigation holds. Messaging Architects will demonstrate how the three main components of its integrated M+Platform bridge compliance and security gaps, and reduce messaging costs without sacrificing functionality or quality of service. HIMSS09 is not only a remarkable educational forum, it gives us the opportunity to meet our customers, discuss the impact of the healthcare IT provisions in the American Recovery and Reinvestment Act, and provide guidance in how healthcare organizations can minimize the cost and complexity of managing email risk and compliance. Designed as policy-based applications with regulatory and corporate governance in mind, M+Guardian and M+Archive provide healthcare workers with integrated tools to protect and share critical medical data across the organization in real time at the point of care. As a high-performance solution that provides seamless messaging with numerous clients, including Outlook, Notes, GroupWise, and Thunderbird, M+Netmail extends email and calendaring services to healthcare workers around the world. Messaging Architects representatives will be available for product demos at HIMSS09, booth #8406. Founded in 1995, Messaging Architects is a global builder of infrastructure for Business Driven Email. We provide software and services that deliver 100% uptime and compliance. Thousands of organizations worldwide depend on our solutions for risk-free messaging and collaboration. For more information, visit our website at www.messagingarchitects.com. Published by Traci McCready & Chris Hatcher in workspan, this article examines how career development and succession planning are two sides of a single coin. Chicago, IL (PRWEB) March 31, 2009 -- Axiom Consulting Partners LLC announced today that WorldatWork has published its article titled ‘How to Align Career Development and Succession Planning’ in its March edition of workspan magazine. WorldatWork is the preeminent organization of total rewards practitioners and we are especially pleased that Axiom has been asked to share our approach for aligning career development and succession planning as some of the key elements of the rewards mix. Total Rewards are all of the tools available to the employer that may be used to attract, motivate and retain employees. Total Rewards include everything the employee perceives to be of value resulting from the employment relationship, which include the following five elements: 1) compensation, 2) benefits, 3) career, 4) culture and 5) work environment. 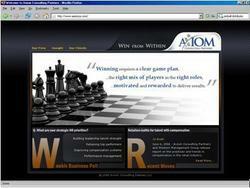 ‘How to Align Career Development and Succession Planning’ is available for download at Axiom’s website. Axiom Consulting Partners is a management consulting firm that specializes in hardwiring people to business strategy to deliver improved performance and results. Axiom asks the right questions to uncover and remove disconnects that commonly exist among the boardroom, middle management and front line employees. Axiom’s Partners generate insights and develop recommendations for their clients that have a quantifiable business impact. VISANOW will enable Accurate Background’s clients to manage their global workforce more strategically and cost-effectively. Lake Forest, CA (PRWEB) March 31, 2009 -- Accurate Background, Inc., a nationwide background screening company, announced today a strategic partnership with VISANOW. The leader in global online immigration services, VISANOW will enable Accurate Background’s clients to manage their global workforce more strategically and cost-effectively. Using VISANOW’s patented online process, human resources professionals can efficiently manage visas for their foreign employees and benefit from VISANOW’s unrivalled 99.6% approval rate, 30 minute attorney response time, and flat fee structure. We are continuously looking for ways to offer our clients the best available services on the market and VISANOW has the resources to save our clients time and money. In turn, VISANOW clients will have access to the background screening tools and technology offered through Accurate Background allowing them the global flexibility and improved efficiency to better manage and standardize their background screening programs. Accurate Background offers a full suite of background screening services designed to help organizations protect against potential liability and unexpected losses while maintaining compliance with federal, state and industry requirements. In finalizing the partnership, VISANOW and Accurate Background evaluated a wide range of factors including company size and position in their prospective industries, product and technology functionality, customer service and client satisfaction, and the flexibility to service their mutual clients. “In times of increasing economic pressures, HR departments need to demonstrate clear ROI from their investments in talent acquisition. Best-in-class services for candidate background screening and work authorization are critical to maximizing the value provided by global talent pools. We are excited to partner with Accurate Background to offer greater value to our mutual clients,” says Robert Meltzer, CEO of VISANOW. screening solution was awarded the American Bankers Association’s exclusive endorsement through its affiliate, the Corporation for American Banking. For more information about Accurate Background and its products, call 800.784.3911 or visit their web site at https://www.accuratebackground.com. VISANOW has redefined the way immigration services are delivered with a process that consistently provides faster responses, allows greater access to information and saves time. Since 1997, VISANOW has combined superior client support and innovative technology to successfully simplify and optimize the immigration process for thousands of corporations and their foreign employees. For more information, visit http://www.visanow.com. Dallas/Ft. Worth, TX -- Job seekers can now personalize, prioritize and organize their online career search process, tools and resources with today’s release of EmploymentTalk™ Version 4, from Insala, a global provider of outplacement and career transition software. We received fantastic feedback from literally hundreds of outplacement professionals and career coaches who helped guide this release. An upgrade to Insala’s career transition technology, EmploymentTalk™ Version 4 features a self-driven activity dashboard, and is designed to help the rising number of individuals seeking re-employment services in the wake of mass layoffs. The redesign incorporates enhanced administrative functions enabling higher volume outplacement and job seeker services to be delivered by providers using EmploymentTalk™. Efficiency is increased for not just the legacy outplacement firms, but also for recruiting firms, job boards, government employment agencies, universities and career centers that are also offering higher touch reemployment services. Insala reported a fourth quarter increase of 42% year over year in the number of active users of the EmploymentTalk™ system, many of whom will benefit from this upgrade. U.S. clients have experienced a 57% increase in the fourth quarter of 2008, compared with Q4 of 2007. In the U.K. an increase during the same period is nearly 20% and a notable 90% increase for the E.U., illustrating how some organizations are relying more heavily on outplacement assistance for employees affected by layoffs and redundancies. “Millions of people’s jobs are impacted by the global economic crisis. Fortunately the Internet combined with proper networking or social interactivity represents a vital lifeline of hope for quicker reemployment. EmploymentTalk™ Version 4 plays a crucial role for more positive outcomes and success by connecting service providers with those in need. There has never been a more important time for Insala to launch our next version of EmploymentTalk™,” says Phillip C. Roark, Chief Executive Officer at Insala. Insala partners with organizations to develop and deliver business strategy solutions and to maximize human capital in today’s competitive and changing social and economic environment. Insala’s powerful outplacement and career services technology solutions are utilized by organizations worldwide. The Insala Solution Suite spans outplacement, succession planning, career development, performance management, leadership development, employee surveys, and mentoring software. 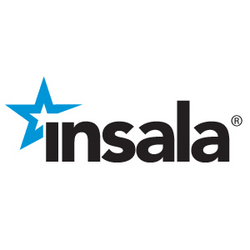 Delivering unique solutions through advanced technology, content and consulting services, Insala solutions offer sustainable, measurable value with long-term impact for organizations worldwide. For more information, please visit us at www.insala.com. Todd Oldham's L-7 Designs Adds Wrongful Termination to Lawsuit Against Old Navy. L-7 also claims that Old Navy failed to honor terms of a License Agreement as agreed by both parties and fraudulently induced Todd Oldham to enter into both agreements through multiple misrepresentations. New York, NY (PRWEB) March 30, 2009 -- L-7 Designs Inc. and its principal shareholder and President, the designer Todd Oldham, today announced that L-7 Designs has filed additional claims in its pending action in the United States District Court for the Southern District of New York, 09CIV.1432(DC), against Old Navy Inc., a Gap Inc. company. In addition to L-7's prior claims asserting breach of contract and fraud, L-7 is suing Old Navy for wrongful termination of the parties' Creative Services Agreement. L-7 alleges that Old Navy breached the Creative Services Agreement with L-7 by failing to negotiate the terms of a License Agreement relating to the production of a Todd Oldham line of branded merchandise as announced by Old Navy in September 2007; Old Navy failed to honor terms of a License Agreement as agreed by both parties in February 2009 and wrongfully induced Todd Oldham to enter into both agreements through multiple misrepresentations; and, Old Navy has deliberately and knowingly jeopardized the integrity of the Todd Oldham marks and the reputation of the designer through its actions and wrongfully terminated the Creative Services Agreement on February 20, 2009 on grounds that L-7's filing of suit against Old Navy constituted a breach of the Agreement and grounds for termination. For the first time in 20 years in business, we have no choice but to enforce L-7's rights through the courts. We are saddened that it has come to this, however, Old Navy's attempt to achieve short-term savings appears to have led it to willfully breach our agreements, and wrongfully terminate the Creative Services Agreement. "Over the past 20 years, L-7 Designs has built a successful multi-faceted design business that encompasses fashion, furniture, interior design and accessories, book titles and TV shows, home furnishing collections for Target and a long standing dedication to charitable design work," said Todd Oldham, President of L-7 Designs. "For the first time in 20 years in business, we have no choice but to enforce L-7's rights through the courts. We are saddened that it has come to this, however, Old Navy's attempt to achieve short-term savings appears to have led it to willfully breach our agreements, and wrongfully terminate the Creative Services Agreement." The suit seeks measures that will make L-7 whole, including a declaratory judgment that Old Navy violated its agreement with L-7 Designs and an award of actual and compensatory damages arising from Old Navy's breach.